These shots, in spirit of a Sunday night, go out to anyone wishing the weekends could have lasted at least a couple of hours longer thus letting enjoy those quiet long winter evenings with our loved ones. Uninterrupted and carefree. Time flashes by so fast though, that at least I'm trying to capture these little memories in a form of irrelevant fashion game. After all relationships is what we live for... Yet here goes... In spirit of this blog... From the top... 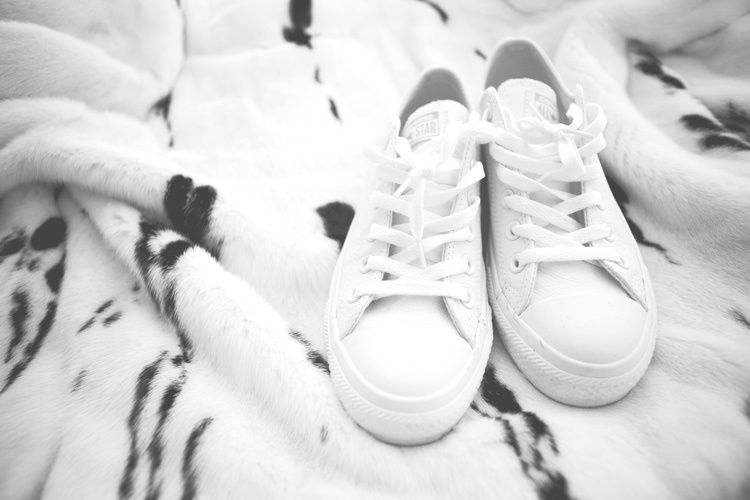 I am obsessed with this whole leather Chucks kind of business lately. Nothing could have been more perfect than absolute whiteness. Winter proof to a certain degree and versatile beyond any measure (all the Converse lovers out there will know what I mean). Then goes that sleepy blur of a bedroom. For inspiration purposes mostly. And maybe a little bit in commemoration of my lack of sleep for the past four and a half months. Hoping there will be a night some time soon when I'll be able to slide under the covers and to indulge in about seven or eight hours of uninterrupted dreamland fairy tail. The last one is how I wear my Sophie Bille Brahe mid knuckle pearl lately. It just makes so much sense against the backdrop of a random cashmere knit.